A common calculation in trend analysis is the moving (or rolling) average. A moving average is the average of the, for instance, last 10 rows. The moving average shows a more smooth curve than the actual values, more so with a longer period for the moving average, making it an good tool for trend analysis. 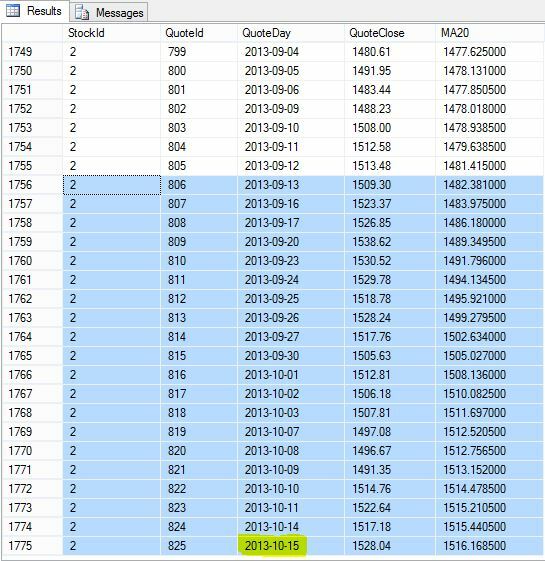 This blog post will show how to calculate moving average in T-SQL. Different methods will be used depending on the version of SQL Server. The chart below demonstrates the smoothing effect (red line) with an 200 days moving average. The stock quotes are the blue line. The long term trend is clearly visible. The demonstration below requires the TAdb database that can be created with the script located here. In the upcoming example we will calculate a moving average for the last 20 days. Depending of the version of SQL Server, there will be a different method to do the calculation. And, as we will see later, the newer versions of SQL Server has functions enabling a lot more effective calculation. Rows preceding is 19, because we will include the current row as well in the calculation. As you can see, the calculation of moving average in SQL Server 2012 is pretty simple. The results of the calculations in older versions of SQL Server are the same, so they will not be shown again. As you can see, the windowing function improvements in SQL 2012 makes a huge difference in performance. As mentioned in the beginning of this post, moving averages are used as a tool to illustrate trends. A common approach is to combine moving averages of different lengths, in order to spot changes in the short, medium and long term trends respectively. Of particular interest are the crossing of trend lines. For instance, when the short trend moves over the long or medium trend, this can be interpreted as an buy signal in technical analysis. And when the short trend moves under a longer trend line, this can be interpreted as a sell signal. The chart below shows Quotes, Ma20, Ma50 and Ma200. T-SQL Ma20, Ma50, Ma200 buy and sell signals. Excellent, what a weblog it is! This web site gives helpful facts to us, keep it up. Thanks, a lot! You saved my life!